When I fill up my daily-driver Prius, the price of gasoline isn't that important. But when I occasionally take a trip in my V8 Suburban, I pay a lot more attention! 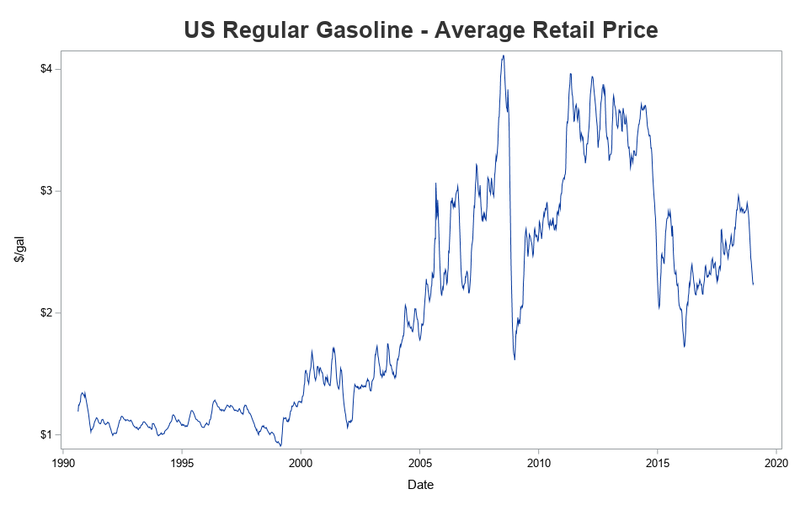 Therefore I was pleasantly surprised when I noticed that gasoline prices have been falling. How much have they fallen, and how do the current prices compare with the past prices? ... Let's graph some data, and find out! Now, let's analyze that price data! 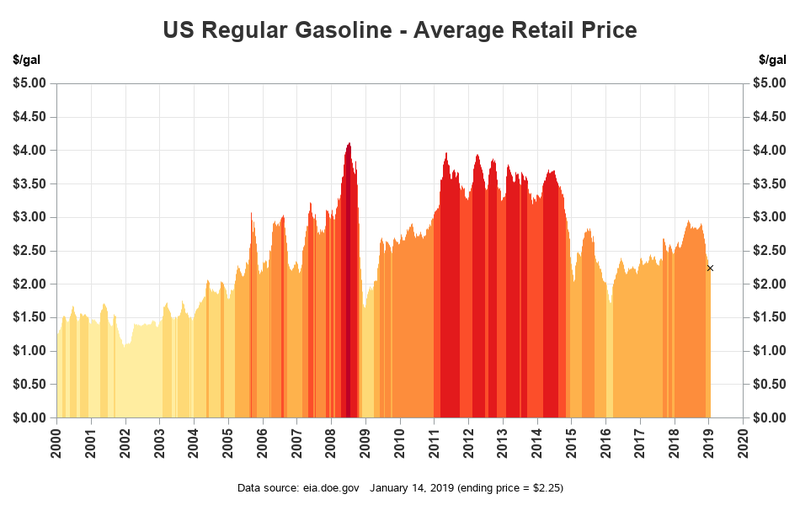 Fortunately, the Energy Information Administration tracks the average price of gasoline in the US on a weekly basis, and has that data available on their web page. I downloaded their Excel spreadsheet, imported it into SAS, and created a preliminary plot. Now that my y-axis starts at zero, it becomes more evident that what I'm really wanting to show & compare is the value under the line. A bar chart is typically used for such comparisons, but in this case there are way to many weekly values to plot using bars - or are there?... What's the skinniest 'bar' we could use? How about using a bar that's 1 pixel wide ... which we call a 'needle'! A needle plot simply draws a line from the data point to the horizontal axis, and functions like a bar chart with very skinny bars. Below I have changed from a series plot to a needle plot, and also added a second y-axis on the right (to make it easier to see the prices, for the most recent data). 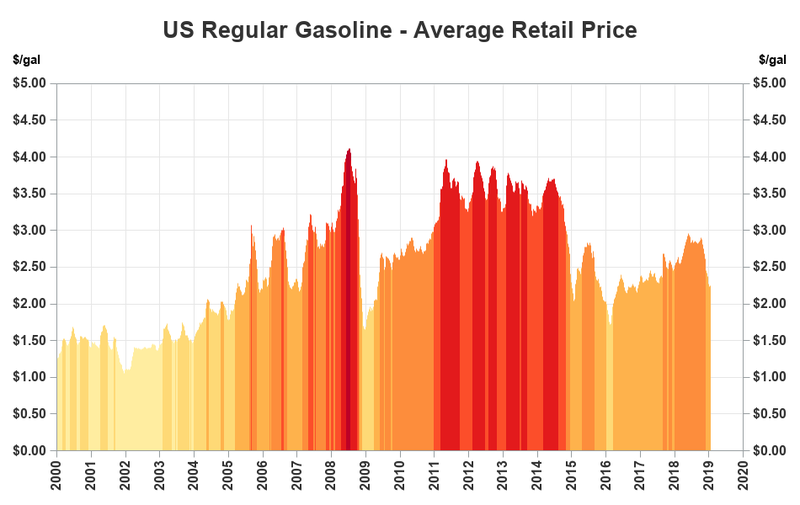 Although the graph has grid lines and two y-axes, it's still a bit of mental work to 'see' when the gasoline prices crossed certain milestones. Why not add another visual dimension to help - lets add color! I assigned a different color for each needle line, with the color getting darker at every 50-cent increment (which corresponds to my grid lines). I think this color dimension is what makes the graph! 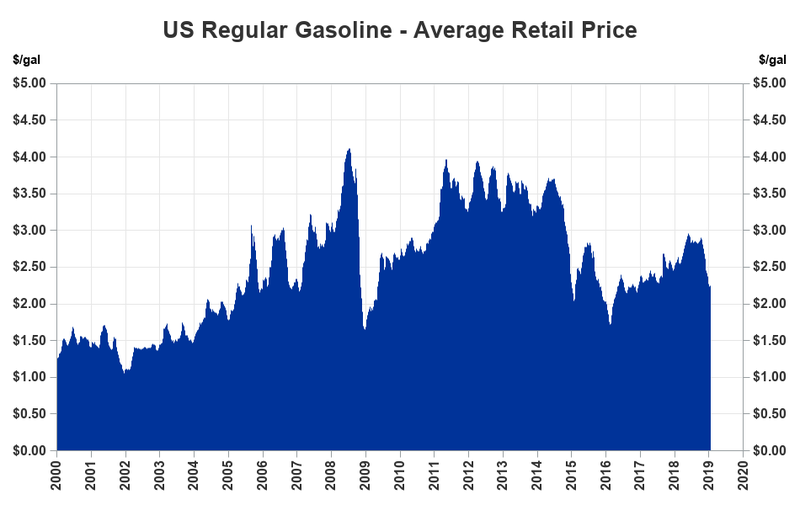 From this graph, you can see that average US gasoline prices peaked in 2008 (just before the big worldwide recession) at over $4/gallon. The current price is $2.25, which is fairly low, but not as low as it dipped in 2016. 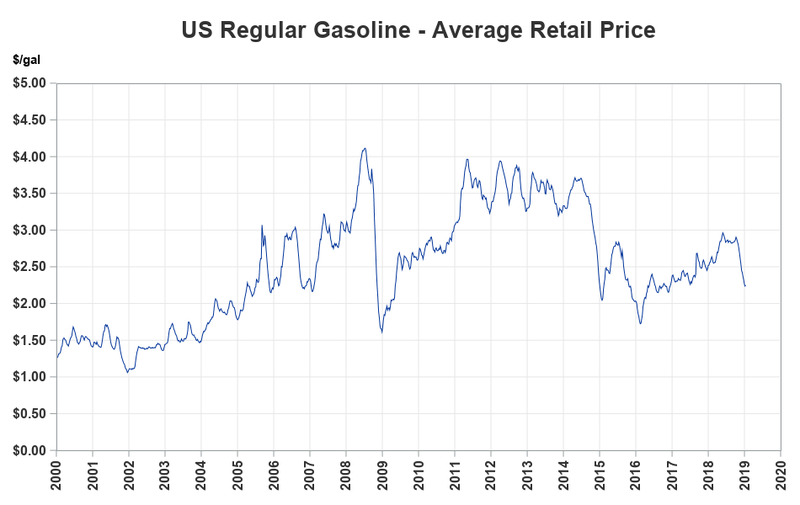 What are your predictions for gasoline prices this year (feel free to discuss in the comments section). Here's a link to the SAS code used to create all these graphs, if you'd like to see all the tricks used! I really enjoyed this post, Robert! The progression, with steps, of the initial data load to your "final product", was really helpful. In The Bahamas, where I am from, gas was around $4.95 cents a gallon when it was at it's lowest here in the USA over the last month. This might be an off topic question—but any specific reason you used sgplot and not gplot for this one? I ask because you usually favor gplot. Chris Hemedinger wants me to use sgplot (ods graphics) instead of sas/graph, in my blogs from now on, since it's a more modern SAS offering. Oooookay. To be honest what has always kept me away from sgplot is the look of the SAS samples I’ve seen so far. They look like something from an alternate universe where Lotus 1-2-3 is still a thing. Version is also an issue. We’re currently on SAS9.4 M2 (this sample requires M3)— updating our production server is usually a big ordeal involving lots of red tape. 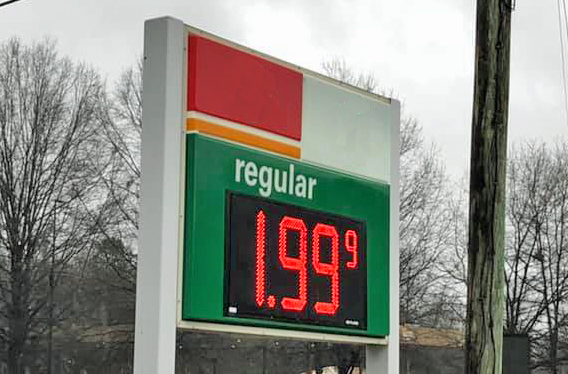 I saw a $1.94 in Cary, NC today 1/16/19. Does diesel#2 follow the same comparison as well as any other intermodal or commercial fuels like CNG or coal for power generation or commodity fuels for trains, planes, and ships? Would be insightful to see those patterns? If you forecasted this, what would it look like? Graph guy is back!!! Good to see your posts again Robert.